Paradigm Electronics Inc. (Paradigm) has over 30 years of experience in audio / video products.Its products come under four main collections: the Signature collection, Reference collection, Classic collection and the SHIFT collection. The SHIFT collection is the newest, launched in 2011, with a focus on compact, portable, easy-to-use products. 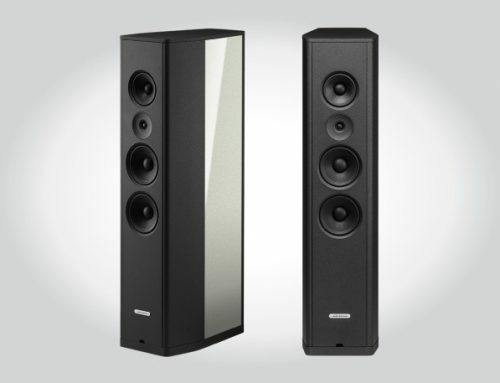 The Paradigm SHIFT Soundtrack System ($799), which began shipping recently, clearly fits into the SHIFT mantra with its compact size, multi-driver powered soundbar and wirelessly connected powered subwoofer. The Soundtrack System arrived in a large box in which I found the components neatly and well packed. Amid the soundbar and subwoofer were the following accessories: wall-mounting brackets; soundbar slide-in feet; a power supply and power cords; a set of analog RCA interconnects; an optical (Toslink) digital interconnect; and a low-profile mini remote. In addition, there were feet for horizontal positioning of the subwoofer, as well as a cradle and a 90-degree RCA adapter for optional upright placement. Last but not least, I found a printed set-up guide and owner’s manual. The set-up guide was very useful, with simple diagrams and instructions that allowed for a setup, with the subwoofer wirelessly connected in less than 15 minutes. I chose to sit the soundbar on top of my audio-video rack using the feet provided and I set the subwoofer flat using its screw in feet. Wall-mounting and/or a wired subwoofer connection will undoubtedly take more time but you can expect an easy setup, regardless of the alternative you choose. The Soundtrack System was svelte in form, with curved edges that made the soundbar and subwoofer look even smaller than their modest dimensions. Build and finish was good, though not extravagant. 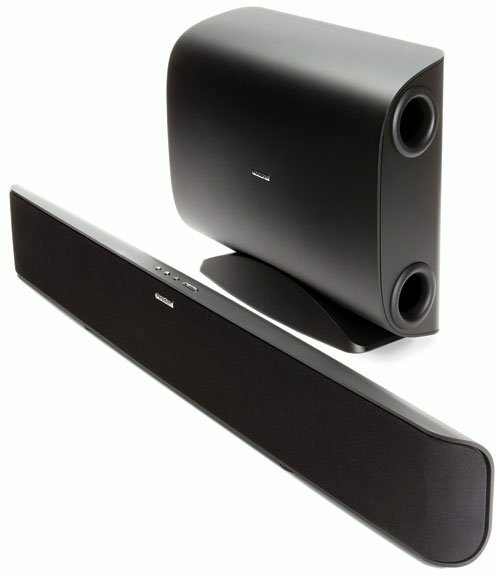 The body of both the soundbar and subwoofer are constructed of molded black ABS plastic, having a satin texture. Other than the small silver Paradigm name badges on both pieces, there was little in the way of adornment. I’m sure Paradigm has taken this straightforward approach to styling to ensure the Soundtrack system looks as neutral as possible – increasing its ability to integrate within any décor and avoiding undue attention. The soundbar sports a removable (magnetically affixed) fabric covered grille that conceals an array of 6-drivers (two 4.5” mid-bass drivers with two 4” passive radiators, all made of mineral-filled polypropylene and a pair of 1” satin-anodized pure-aluminum dome tweeters). The grille fits precisely and securely. Removing the grille revealed a contoured front baffle with integrated waveguides. An LED status indicator glowed when the soundbar was plugged in – “red” for standby and “blue” for go. Atop the soundbar were a few tiny silver buttons for power on/off, input select, wireless sync and system volume. Sadly, these buttons felt imprecise and were not in keeping with the otherwise robust construction – they had me constantly second guessing my presses. On the back of the soundbar was a power jack, a 3.5 mm stereo input jack (for mobile devices), a stereo set of RCA input jacks and a digital optical input jack (however, no HDMI). With the addition of Paradigm’s optional BD1 Bluetooth receiver, the Soundtrack system can stream audio from a smartphone, tablet or laptop. Moving to the subwoofer, there was an 8” laminated composite cone woofer on the underside and twin circular horizontally aligned ports on one end of the enclosure. Next to the woofer there was a power status LED, a switch for selecting wired/wireless operation, a master bass volume control and an RCA input jack for an optional wired connection. I experimented with the master bass volume but found that the marked 12 o’clock factory set position provided the most even balance and more than sufficient output. The remote was a tiny card-like IR type – which I found didn’t work effectively, as it needed to be pointed dead-on to the soundbar, had limited range and required very deliberate presses. To the remote’s credit, it is a full-function model with power, input selection and volume buttons, and can be programmed to control basic functions of most TVs and cable boxes. The Soundtrack system is a two box affair – with a soundbar and a wireless subwoofer. The soundbar houses twin left-right channels, both 2-way with 3-drivers (1” tweeter, 4.5” mid-bass and 4” passive) with a frequency response of 140 Hz to 20 kHz. 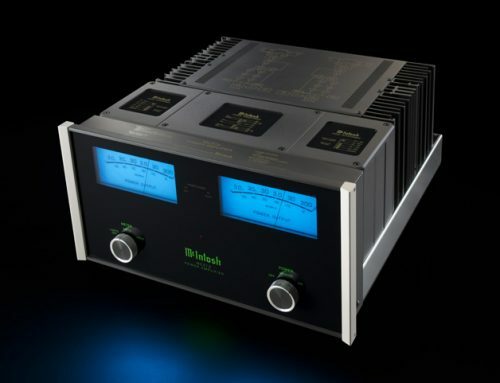 The integrated amplifier is 2 x 25 Watts (RMS) / 2 x 50 Watts (Peak). 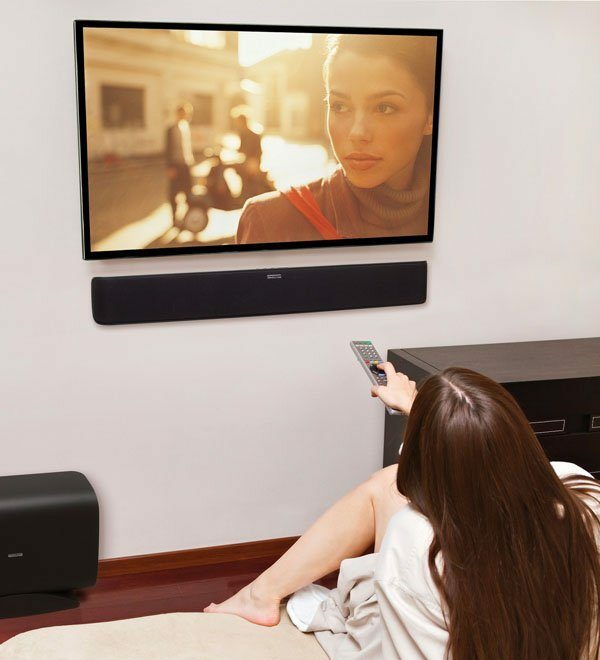 The soundbar measures 5-5/16” (H) x 36-3/8“ (W) x 2-15/16” (D). The subwoofer utilizes a single 8” woofer in a bass-reflex enclosure, powered by a 120 Watt (RMS) / 240 Watt (Peak) Ultra-Class D amplifier. Paradigm uses digital signal processing (DSP) and a soft-clipping circuit to ensure that clarity is maintained at the highest volume. Low frequency extension is 33 Hz / -3 dB in a typical room. Dimensions are: 14-3/16” (H) x 18-5/16” (W) x 6-5/16” (D). I should mention that the wireless range between the soundbar and subwoofer is 50’ / 15 meters using a 2.4 GHz uncompressed digital signal. With the Soundtrack System hooked up to my Panasonic VT25 HDTV, using the supplied digital optical cable, I took a quick listen. I was cautious not to pre-judge, after-all, the manual even pointed out the need for several hours of break-in. What I can say is that, right out of the box, speech was clear, though I did notice some treble hardness. At 12 hours or so, I gave it another listen and heard a smoother, more open and relaxed top end, as well as a more cohesive tonal structure. I gave the Soundtrack System over 100 hours of run-in before taking any notes for this review. In my room, I sat the subwoofer in the front right corner, about four feet from the front wall and one foot from the side wall, sitting directly on the hardwood floor. This position garnered the best result from my primary seat, which sat dead centre and 13 feet away from the soundbar. With the soundbar sitting on my equipment rack, the centre point of the tweeters was approximately 26” off the floor. Though the specifications for the soundbar indicate no roll-off at up to 30-degrees off-axis, I took the precaution of tilting the soundbar up with some foam rubber wedges to ensure the tweeter was on-axis with my ears – a 36” height at my primary seat. In addition, I put the soundbar’s face flush with the front edge of the top shelf of my rack, to avoid any chance of reflection off the face of the shelf and ancillary distortion. Playing with the volume control, I discovered it had 51 steps from the lowest to the highest setting, as counted by way of the flashing blue LED on the soundbar. Sound just became audible at 10 blips up; 20 to 25 steps was low; 35 medium and 40 to 45 produced room filling sound with full dynamics – perfect for focused movie watching. At above 45, a noticeable compression began to set in though distortion was still well controlled. I did not listen at above 45 since such a setting resulted in mechanical movement of the subwoofer and audible clatter between its feet and the hardwood floor. I would expect a rug, carpet or cork feet would serve to quell much of this. I do wish there was some sort of simple visual indicator of volume level – it would have saved me all the counting. I did some listening to music channels through my cable TV provider – jazz, acoustic rock and even atmospheric spa stations. I noticed that the sound was overall pleasant, carrying even a touch of warmth but with a good measure of detail, especially in the upper midrange. The subwoofer was surprisingly adept at delivering bass texture from an upright acoustic bass. Here I was quite surprised because virtually every home-theatre-in-a-box system I’ve heard comes with a noticeable bump in bass around 60 Hz, resulting in opaque and indistinct bass notes – no such issues with the Soundtrack System. Rather, the Soundtrack System delivered bass articulation and dynamics with aplomb, even more astounding given its humble size and low price point. Vocals were clear, though a little forward in the mix, with some occasional slight excesses in sibilance. Continuing on the music theme, I hooked up my Rega Apollo CD player to the Soundtrack via its digital optical out thus, relying on the Soundtrack system’s internal digital-to-analog converter (DAC). Listening to an album I know only too well, Melody Gardot’s Worrisome Heart – Melody’s voice on the title track was portrayed very clearly with a touch of warmth and a slight extra focus on sibilance. The bass had good body and a very respectable measure of detail. Imaging (depth, horizontal and vertical positioning) and soundstage size was quite limited – with Melody’s voice a little lower than usual and all elements in the track centrally located. On another note, the Soundtrack system was more than adept at filling my 16’ x 17’ family room with music. By that I mean, it provided virtually any spot in front of the soundbar with a fairly even frequency response and steady sonic performance. I have to attribute this to a very well-engineered dispersion pattern, perfect for a home theatre product, as it makes every seat a good seat. I did experiment with connecting my CD player to the Soundtrack System using the RCA analog inputs, which provided a smoother and richer expression of this track, with less sibilance, suggesting that a source with a high-quality internal DAC, like that in my CD player, might be better to connect using the analog RCA input. Moving back to my Panasonic VT25 HDTV, as the optical digital source – I began flipping through Netflix, and came across King Kong, the 2005 version. Watching the movie, I took note of the ship moving across the screen, its engine sound chugging and noticed that panning of sound from left to right was minimal. Despite that being the case, a number of high frequency sound-effects did eerily cast away from centre – reaching, up to two feet, left and right of the soundbar and even occasionally gaining some perceived height. Bass frequencies did add scale and apparent depth to the soundfield, making for an immersive experience. The tonal qualities of the Soundtrack system seemed quite natural and balanced, yet maintaining a distinct midrange that added to the intelligibility of spoken words. I was continually enamored by the refinement of the highest frequencies, as they sounded silky with an airy quality that I’ve never counted on getting from compact, affordable lifestyle systems. The lower treble / upper midrange did occasionally bare a little extra edge but I found that this served to define consonants on spoken speech, making words a little easier to understand. Moving around the room I took note again of the great dispersion; an evenness of tone across a wide range of positions. The Soundtrack System not only plays for one but for an audience. In King Kong, as the ship faced a storm on arrival at Skull Island, the Soundtrack system was called to action. Here I found the ominous thumping of drums to be tight and solid, and I noted that the bass frequencies were strong yet still well textured. The crashing of the ship against the rocks was produced in a dynamic and convincing manner and the system was able to literally shake the floor of my home. The overall soundstage was generous, if not cavernous and I found myself transfixed by the action – always a good sign. On Skull Island, at the first meeting with the indigenous people, the eerie sounds and whispers were very spacious – again and again I was impressed with the finesse in which the Soundtrack system could deliver the top treble. I was also able to watch Star Trek, Into the Darkness during my time with the Soundtrack System. The opening chapter included an engaging scene with the Enterprise emerging from an ocean, as well as an aggressive impending volcano eruption. This scene was produced with impressive dynamics and weight – way above what it had the right to given its meager size. It was not only the quantity of bass and its apparent depth but the quality that had me wondering – how have they managed this? This is not one of those typical feeble mini-systems. In Star Trek, I was able to get a good sense of how well the Soundtrack could handle speech, music, low-level detail and explosions. I took note of the brilliance in the clinking of metal, noticeably crisp and clear. Though I found speech very clear, I did note that on a couple deep male voices, like those of Kahn and Pike, in some specific scenes, the Soundtrack System seemed to disconnect between the bass and lower mid-range – making these voices sound boxed-in. With all the action I took note of the Soundtrack System’s ability to deliver transients with speed and punch, making for an exciting experience and all this was done with the subwoofer connected wirelessly, without a hitch. The Soundtrack System is a well-built, well-engineered, compact home theatre system that is easy to setup. It provides a level of performance that had me amazed, given its price, simplicity and size. Though it can’t quite provide the immersive experience of a well-designed 5.1 home theatre system, it is very capable of providing a captivating experience, while being both décor and budget friendly. If you’re looking for a home theatre system with a high-performance-to-price ratio, a small footprint and virtually no wiring, there may not be a better pick than the Paradigm SHIFT Soundtrack System.